A rich, dry, complex still red wine from the Veneto region in northern Italy, Amarone is usually produced from 3-4 indigenous grapes (mainly Corvina Veronese blended with Corvivone, Rondinella and Molinara) cultivated high on its hillside terraces in the historical Valpolicella Classica zone, using the traditional "pergola veronese" method of vine training. Only the best and most mature clusters are selected for the production of Amarone, the other grapes may be used to produce Valpolicella and Ripasso wines. Once carefully selected and harvested usually during the first two week of October, the grapes are placed directly onto small open racks and brought to the open sided building where they are dried by the cool breezes of late autumn and winter. The harvested bunches preferably have fruits not too close to each other, to let the air flow, which will be important for the drying period. Grapes are then allowed to dry, traditionally on straw mats. This process is called “appassimento” or “rasinate” (to dry and shrivel or “raisinate”) in Italian. In order to produce Amarone, the work of ageing and drying the grapes is not completed at the time of harvest but continues through the winter months until February. During these months the grapes are reduced in a period of "active lethargy". Also during this period, changes (that take place within the drying grapes) enrich them, giving them new aromas, deeper flavors and increasing the sugar ratio due to evaporation. In managing the drying and vinification process, it is essential for the winemakers (in the case of Tommasi: Mr. Dario and Giancarlo Tommasi) to have a clear idea in mind of the style of wine they seek to create. Although, consistency of the taste and style is very important for a winery and more importantly for its winemaker, the vintage is also an influential factor that will also impart the final taste of the wine, in a bad way or in a good way. More especially in Europe where there are more restrictions regarding vineyard’s management and vinification methods than in most new world wine regions, obliging the winemakers of the old world to be more careful to climate, micro-climate, sun exposition, weather hazards, chemical products used and other things like chaptalisation and acidification (or de-acidification, etc...), due to less possibilities and opportunities of manually, artificially or mechanically rectifying the wine in bad or mediocre vintage. Following drying, by the end of January - beginning of February, the grapes are crushed and go through a dry low temperature fermentation process which can last up to 30-50 days. The reduced water content of the grapes can slow down the fermentation process, increasing the risk of spoilage and potential wine faults. New drying techniques done in special rooms (or chambers with temperature controlled conditions) have decreased some these risks. After fermentation, the wine is then aged in barrels made from French, Slovenian or Slavonian oak. "Ca' Florian" is a small terraced vineyard on a slope particularly well suited for growing grapes, with great sun exposure, where the vines are maintain from falling by hand erected traditional “marogne” or low natural stone walls. This Tommasi family vineyard produces Corvina, Rondinella and Molinara grapes of exceptional quality for the production of an exceptional Amarone. 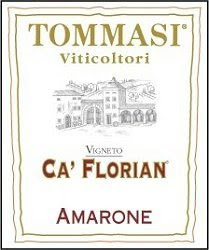 From the acclaimed 2001 vintage, Tommasi Amarone "Ca' Florian"was produced from approximately 70% Corvina Veronese, 25% Rondinella and 5% Molinara . It underwent a period of aging of 2.5 years in Slavonian oak barrels of 35 hectoliters and an additional 6 months in "Tonneau" barrels of 500 liters, before being placed in bottles for a further period of aging of at least another year. Behind the garnet color with slight brick reflects and good intensity, the nose is expressive, earthy and ripe, quite intense and inviting. The palate is quite rich, complex, smooth, rather full bodied and characteristic of great Amarone with dark, earthy fruit, chocolate, raisin and terroir oriented nuances. The lingering finish still has great tannin structure and depth suggesting very good ageing potential. A decantation is recommended to fully appreciate this wine. Pair it with red meat, game, mature cheeses.